My family really enjoyed this meal. I made some omission/substitutions. My ingredient list: 1 precooked rotisserie chicken (skin removed & deboned). 1 can no salt added diced tomatoes, drained (that’s what I had on hand). 4oz cream cheese. Colby jack cheese (that’s what I had on hand). I omitted ALL seasonings for dietary reasons. I completely shelled the avacodos & used the skins as bowls. 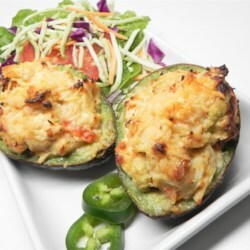 Like others, i added cheese AFTER baking stuffed avacodos for 10mins. Then topped with cheese & broiled for 5mins. There was still ALOT of mixture left & will probably use in red bell peppers tomorrow.